Peter A.G. Nielsen need hardly any introduction. The legendary frontman of Gnags has for 40 years been the frontman , singer and songwriter in Gnags , and with his songs delivered sound track for several generations growing up. An eminent songwriter and Denmark's Mr. Swing King. Live Peter A.G. Nielsen someone a great experience and no one gives so much of himself to his audience. And now the audience can well rejoice , because now comes second Part of Peter AG's acoustic show, which successfully put both critics and the public down. Namely " The Stage Show 2 " , subtitled " Welcome to KøbenhAGn "
In a mixture of rock - poet and musical clown , Peter A.G. Nielsen guide us through the show, which consists of brand new songs written for the occasion and , not least, a judicious mix of all the old Gnags hits. - About courage, joy of life and the sentient human being. The lecture is based on the premise that fewer and fewer involve yourself in what they are doing. We are brought up , so to speak systematically to sell out of ourselves - the more tactile presence , did not see , did not hear , do not smell , do not touch. And when we lose the emotional dimensions , we lose the sensitivity and the ability to experience relationships and cohesion - also with nature. About the artistic dimension and art as a way to learn to know yourself on . About the art as an expression of the joyful harmony between spirit and body. About the experience of art as essentially . The lecture is structured as a one man show . 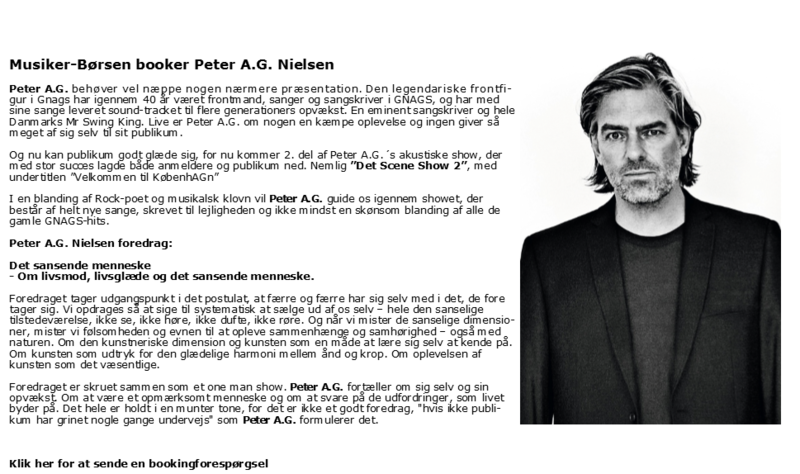 Peter A.G. Nielsen talks about himself and his upbringing. About being an observant person and to respond to the challenges that life offers . Everything is kept in a cheerful tone , because it is not a good lecture , "if not the audience laughed a few times along the way " as Peter A.G. Nielsen puts it.